Escorts Limited has reported profit of `120.7-crore in quarter ended June 30, 2018, up by 92.7 per cent as against a profit of `62.6-crore in corresponding quarter of the previous fiscal and up by 7.2 per cent as against `112.5-crore in sequential quarter. Revenue from operations is up by 29.9 per cent correspondingly to `1,511.3-cr., and up by 5.2 per cent sequentially. EBIDTA for the quarter correspondingly is up by 90.2 per cent at `185.5-crore as against `97.5-crore in quarter ending June 2017 and sequentially up by 6.8 per cent against `173.8-crore in quarter ending March 2017. EPS reported at `10.10 as against `5.24 in corresponding quarter. 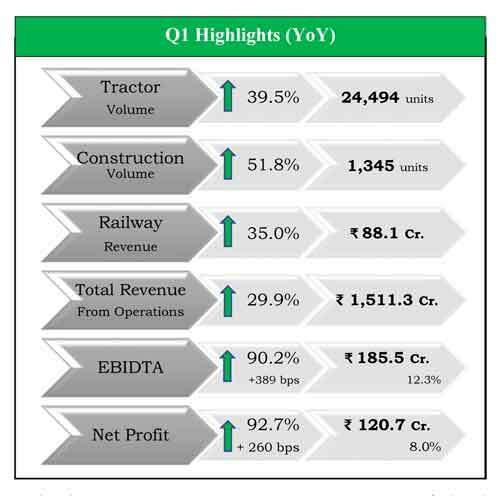 Construction equipment sales in the quarter ended June 2018 was correspondingly up by 51.8 per cent to 1,345 units against 886 units in quarter ended June 2017. Segmental revenues increased correspondingly by 49.5 per cent at `246.0-crore in quarter ending June 2018 as against `164.5-crore in quarter ended June 2017. EBIT margin is correspondingly up by 451 bps, and stands at 2.4 per cent for quarter ended June 2018. The reviewed accounts of the quarter ending June 2018 have been approved by the Board of Escorts Limited.